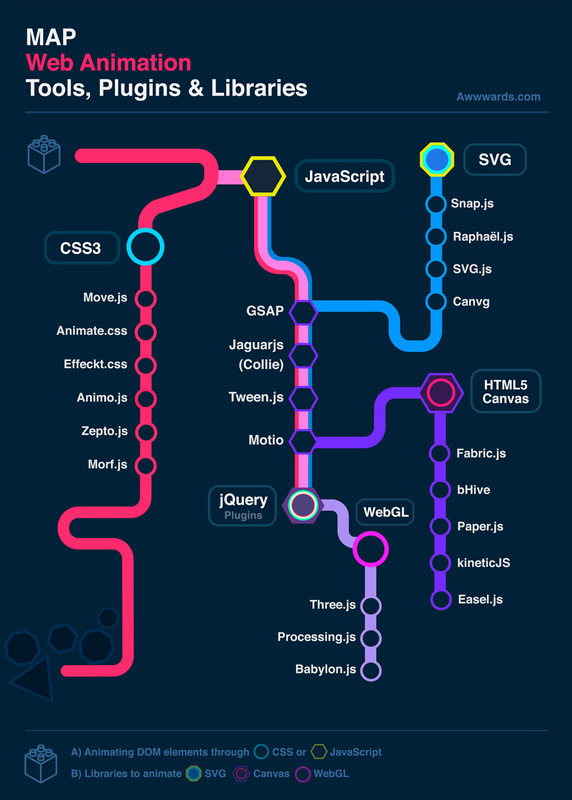 Today we have decided to showcase a 'map' of the current state of web animation by compiling highly regarded libraries, frameworks and plugins based on their versatility and performance. 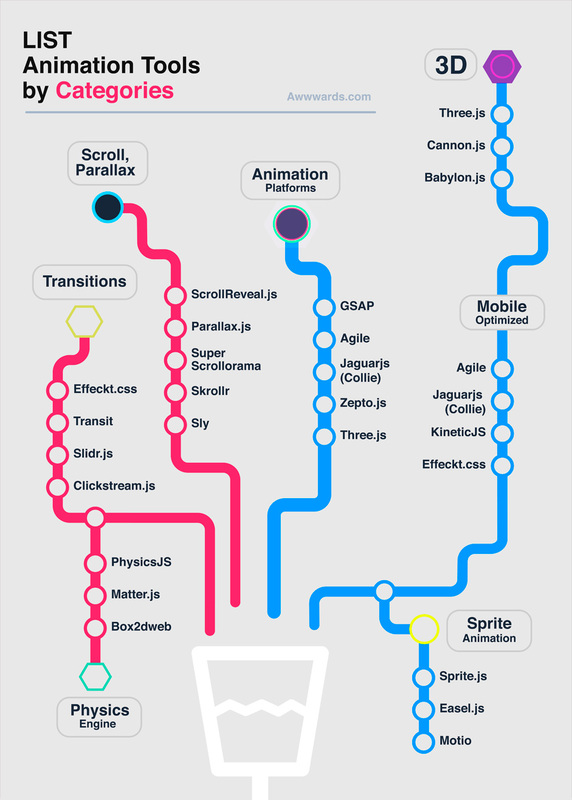 The second section is dedicated to the various methods for animating UI elements and any others objects in the DOM like scroll animation, parallax, sprites, 3D transformations, physics engines, and transitions. The B2 posters (50 x 70cm) are FREE and available for downloading and printing. Get yours NOW! All you need to do is SHARE it on Twitter. All we can do is recommend a couple of interesting articles and opinions that ought to give you a helping hand when the time comes to make your decision. 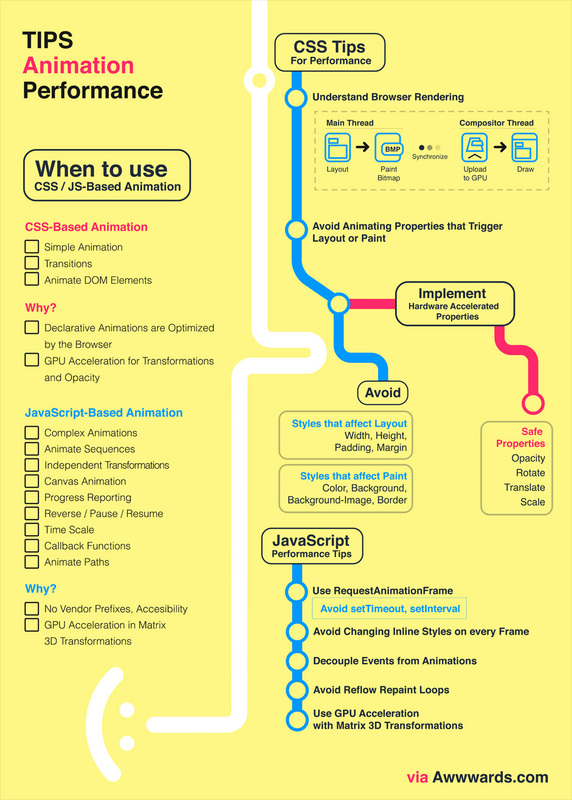 CSS Animations and Transitions Performance: Looking inside the Browser by The Adobe Web Platform Team. We recommend you read this piece which perfectly explains browser rendering processes and issues. The third, and perhaps the most notorious article comes from Paul Irish: Why Moving Elements with Translate() is better than Pos:abs Top/Left. Paul Irish makes another appearance alongside Paul Lewis to discuss High Performance Animations. Not to be outdone, here comes Paul Lewis again with his insightful article on animation performance: Leaner, Meaner, Faster Animations with requestAnimationFrame. Declarative on-scroll reveal animations. An open-source project by @JulianLloyd. A Performant Transitions and Animations Library. CSS-based transitions using hardware-accelerated properties. Parallax has never been easier. Add some simple data attributes to your markup, run $.stellar(). That's all you need to get started. Scroll right to see Stellar.js in action. The Box2D is a complete physics engine was developed by Erin Catto. Snap.svg is an excellent way to create interactive, resolution-independent vector graphics that will look great on any size screen. Super-smooth CSS transitions & transformations for jQuery. Morpheus lets you "tween anything" in parallel on multiple elements; from colors to integers of any unit, with easing transitions and bezier curves, including CSS3 transforms (roate, scale, skew, & translate) All in a single high-performant loop utilizing the CPU-friendly requestAnimationFrame standard. The jQuery plugin for supercool scroll animation.